This is a beautifully rendered film with an exceptional cast of women (and men)–each playing a “supportive” role (rather than taking center stage) in the story of how lives are shaped. “Evening” takes place during a single weekend–in the past–and in the present. In doing so, it weaves together the fabric of the future with a tender, but delicate touch. The film richly explores the period known as “transition” with a blending of spirit, memory, resolution and love. A graceful hospice worker has a formative role. The relationship between two sisters is stretched and reflected and deepened. 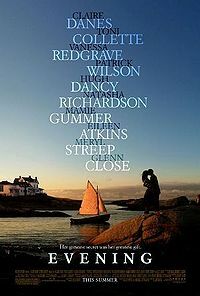 I recommend this lovely film to all, but especially to those wondering about the last days of a loved one’s life. This is a particularly powerful film for daughters and sisters. And for those, like me, who benefit from a regular dip in the mystery.